Your down time is sacred, so why sacrifice comfort or style? Pajamas are an essential way to spend dreamy evenings at home, quality time with your special someone, or even just relax with the morning paper while savoring your cup of coffee, bathed in morning sunbeams. Feel the difference when you snuggle into our super-soft fabrics and express your unique sense of style with our cheeky graphic separates. Our pajama sleepwear separates offer the perfect amount of sporty attitude and feminine charm for the bedroom and beyond. Treat yourself to the best women’s pajama pants possible. Relax at home in style when you slip into these soft Bebe pajama pants. Supremely soft and with a hint of stretch, these pants are perfect for achieving ultimate comfort. These pants are a must-have for weekends and girls nights alike, and they pair perfectly with all your favorite separates.ELASTIC WAIST: The stretchy elastic waistband allows you to move freely without feeling restricted in any way. Lightweight and comfortable, these pants will relax your tired muscles as soon as you slip into the soft material. FUN DETAILS: A cute print and decorative drawstring makes these pants fun to wear and let’s you show off your sense of style without sacrificing comfort. The ankles of the pants are in a solid color to provide a contrast to the all over print. 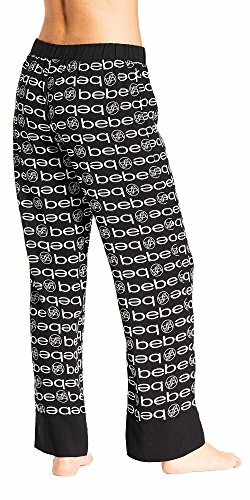 BRAND NAME: The bebe brand name is emblazoned in an all over print around the pants. ULTRA COMFORTABLE: Move freely as the soft material flows around you. So comfortable that you’ll never want to take it off, these pants are a must have for every woman’s wardrobe. MONEY BACK GUARANTEE: If you aren’t 100% satisfied with your purchase, you can return it for a full refund within 30 days of purchase.